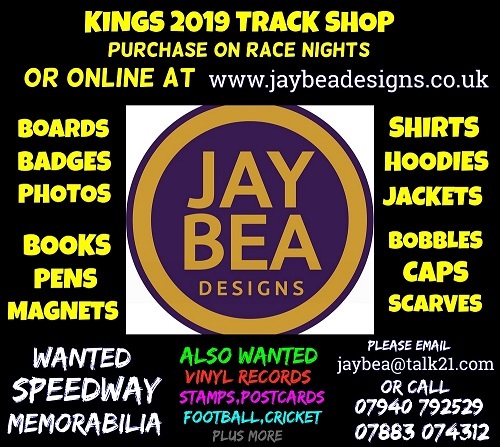 2019 is poised to be a real ‘Back To The Future’ year for Kent’s Speedway comeback man, Rob Ledwith after his spot in the Kings’ side for their next assault on the National League was confirmed. And the former Arena Essex, Rye House and King’s Lynn rider isn’t going at it with half measures – having purchased two bikes from none other than three-times World Champion, Nicki Pedersen. The journey back to racing for one of the most unlikely of comebacks started a couple of years back when Ledwith began to take an interest in the new Speedway track in his Kentish backyard. Based nowadays in Barham near Canterbury, Ledwith started visiting Central Park Stadium to check out the action, over 20 years since his direct involvement in the sport as a rider ended. “It crept up on me really”, he explains. “I started watching Speedway at Kent for the last couple of years and, if I’m honest, I was often expressing an opinion about how I could have done things better than some of the riders. “They entered me into the GB Veterans’ Championship at Lydd earlier this year. I just entered the 4-valve Uprights class to have some fun, not expecting to go out and win the thing. But win it I did and it set the ball rolling in earnest”. 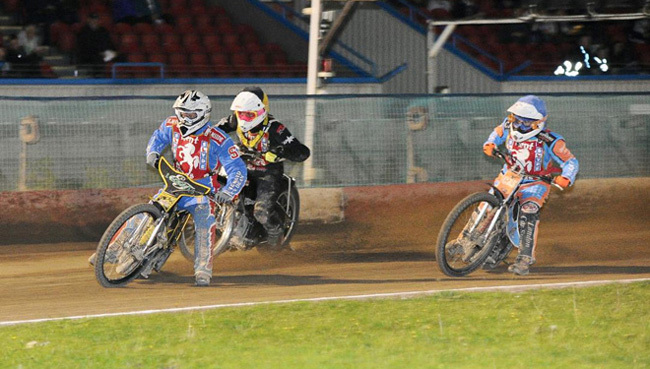 Thanks to backer Nigel Cradduck, Rob found himself equipped with his very first lay-down engine Speedway machine as Nigel purchased former Kent Kings’ skipper Stevie Boxall’s bike for him and all was set fair for his Central Park racing debut last month. And it was no easy start in a second half outing or anything like that. No, Ledwith found himself in a field of top NL riders in Kent’s annual individual championship event, the Laurels. “I knew this really was a big opportunity for me , riding in the closing event of the Kings’ season and my aim was to impress to get myself into contention for a team place for the next season”. Ledwith’s comeback was little short of sensational. After a first race third he reeled off three heat wins – beating pre-meeting favourite and Kings’ skipper Jack Thomas in the first of these and also claiming the scalp of highly-rated teen Dan Gilkes. The double figures score saw Ledwith level top of the qualifiers (with eventual champion, Jon Armstrong) and though a fall in the semi prevented him from a place in the Grand Final itself it was a hugely promising return to competitive Speedway for the quadragenarian who hails originally from Forest Gate in the London Borough of Newham. And it was enough for fellow East Londoner, co-promoter Len Silver to grab the centre green mic to interrupt the presentation party to announce that Ledwith was to be the first new name on the Kings’ team sheet for 2019. “It had been my first time on the laydown type of modern bike but I thought if I had the speed I had a chance. Then again, I’d not ridden against this calibre of rider since my days in the second division with Arena Essex Hammers and so there were certainly a few questions I needed to answer, There were some nerves, but I’d describe it more as apprehension than anything else. I suppose if I was nervous it was about it going wrong and damaging the bike. But I felt confident and comfortable on the machine and it all came back to me as soon as I got out on track”. Having passed the audition with flying colours the immediate offer of those colours being the red and white of his now home county club was just the catalyst needed to go on and launch a truly impressive period of preparation.